Like that LORRI picture, this processed image shows the nighttime glow of the Tvashtar volcano and its plume rising 330 kilometers (200 miles) into sunlight above Io's north pole. 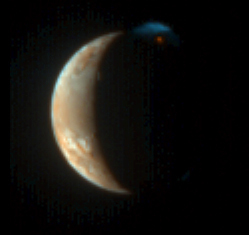 However, the MVIC picture reveals the intense red of the glowing lava at the plume source and the contrasting blue of the fine dust particles in the plume (similar to the bluish color of smoke), as well as more subtle colors on Io's sunlit crescent. The lower parts of the plume in Io's shadow, lit only by the much fainter light from Jupiter, are almost invisible in this rendition. Contrast has been reduced to show the large range of brightness between the plume and Io's disk. A component of the Ralph imaging instrument, MVIC has three broadband color filters: blue (480 nanometers), red (620 nm) and infrared (850 nm); as well as a narrow methane filter (890 nm). Because the camera was designed for the dim illumination at Pluto, not the much brighter sunlight at Jupiter, the red and infrared filters are overexposed on Io's dayside. This image is therefore composed from the blue and methane filters only, and the colors shown are only approximations to those that the eye would see. Nevertheless, the human eye would easily see the red color of the volcano and the blue color of the plume.